The wedding that is stirring up the nation of Nigeria is going to take place this Saturday on the 6th of October at the Loveworld Convocation, Oregun, Ikeja, Lagos. The event is creating an increasingly massive buzz in the country. Pastor Chris is the nation’s most cherished religious leader and has been imparting his profound Christian teachings on to the nation for decades. World-renowned Pastor and man of God, Chris Oyakhilome, the head of Believer’s LoveWorld Incorporation will be giving away his first daughter’s hand in marriage this coming Saturday, on the 6th of October. The lavish ceremony is having a wild impact on millions of Nigerians. Sharon Carissa Oyakhilome, daughter of the man of God will be marrying the Dutch-born Ghanaian entrepreneur, Phillip Frimpong. The event is reportedly getting so much attention that cellular companies are backed up with traffic from the live broadcast. According to Christ Embassy Church, the event is to be available to all around the world and will be available on an exclusive live broadcast from all LoveWorld Radio networks. The LoveWorld app was originally developed to deliver the viewing experience of the Love World satellite station, but after gaining massive popularity, the platform now incorporates additional LoveWorld affiliated apps that allow you to you watch the entire wedding from start to finish. Millions of Nigerians and ardent Pastor Chris fans will be glued to their screens watching the Golden Royal Wedding that takes place on Saturday, the 6th of October. Pastor Chris and his Christ Embassy have been viewed as a beacon of hope and salvation for millions of Nigerians, and of course many more around the world. The imminent event of the man of God’s daughter’s holy union is a national day of pride and Joy for the country of Nigeria. Sharon Carissa Oyakhilome, daughter of the man of God will be marrying the Dutch-born Ghanaian entrepreneur, Phillip Frimpong. 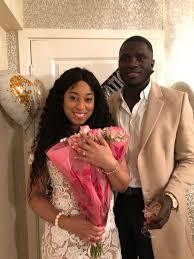 The couple got engaged one year ago after Frimpong popped the question in late October. Phillip Frimpong, the groom, was born in the Netherlands to Ghanaian parents and was raised in the UK. Phillip found himself being drawn back to his African roots. Together, with his sister they created ONUA, a décor company that specializes in African designer prints. Frimpong proposed to the beautiful Sharon Carissa in October in mystery location in Europe last October. As the event draws closer, Nigerians everywhere are rejoicing in praise at this momentous occasion. Millions will be in attendance. For those who cannot attend, an online stream will be available. The wedding is expected to be a once in a life-time experience with prominent minsters, performances and dazzling speeches and sermons. Officiating the wedding is the highly esteemed, Pastor Benny Hinn. Pastor Chris has a deep appreciation for Pastor Benny Hinn. The two have ministered a number of events together. Pastor Chris has stated that working with Pastor Hinn has been one of “the top most blessings” of his life and went on to say that he is simply “special to God”. Countless more prominent minsters are expected to attend the ceremony. Esteemed and notable leaders from around the globe will be in attendance. In addition, there will also be thousands of Christ Embassy community members. Swarms of people will come from far and wide to witness the couple unite in marriage. The event, which takes place in the LoveWorld Convocation center will be attended by thousands. This is without a doubt the most buzzed about event of the year. The nation of Nigeria is singing with joy at the imminent Oyakhilome wedding, the event of the year. The blessed couple are eagerly awaiting their union. Pastor Chris will undoubtedly make it a memorable day for them and wrap the two in a life-long cocoon of blessings. Community members expect for the event to go late into the night, with all the elegantly dressed guests filling up the arena. The hall will be filled with all the lavish decorations and delectable delights fit for a king and queen. The Oyakhilome wedding is on its way.